Xiaomi's next generation flagship phone, the Mi3. Apple's iPhone shipments to China hit a record in the fourth quarter, but the company was pushed out of the top five smartphone makers in the country by strong demand for phones from local vendor Xiaomi. During the quarter, Apple shipped close to 7 million iPhones in China, ranking sixth among smartphone vendors there, according to research firm Canalys. Xiaomi, a maker of lower-priced handsets, beat it to fifth place by shipping 7.3 million phones. Apple launched its iPhone 5S and iPhone 5C handsets in the nation last September, as demand for smartphones in the country continues to soar. Chinese consumers were attracted more to the 5S, due to its higher specifications and its fingerprint sensor, a feature not found in other phones, Canalys analyst Nicole Peng said on Wednesday. "Chinese consumers still want the latest technology in the phone," she said. "The 5C has not been as competitive in the market." Apple, however, could have shipped more iPhones in the period, if not for supply constraints, Peng added. Consumers wanting to buy the iPhone 5S online initially had to wait two to three weeks before the product shipped. During the period, Apple's smartphone market share was at 7 percent. But that figure will grow even more in this year's first quarter, Peng said. Last month, Apple began selling iPhones for the first time through China Mobile, the country's largest carrier with over 700 million customers. Historically, however, Apple has always been far from taking the top spot as China's largest smartphone vendor. Instead, other competitors such as Samsung, Lenovo and Huawei have lead the market. They've done so by bringing their products to China's smaller cities and towns, and offered a broader range of phones at different prices. In the fourth quarter, Samsung maintained its lead as the country's top vendor, with a 19 percent share, while Lenovo held the second spot with 11.8 percent. In all, handset vendors shipped 100 million smartphones to China. Much of the demand has come from lower-end handsets affordable to most Chinese consumers, according to analysts. In China the iPhone 5S starts at 5288 yuan (US$867) when bought without carrier subsidies, but other competitors are selling handsets at half that price, or even lower. Xiaomi's own flagship phone, the Mi3, starts at 1999 yuan. The Hongmi, another Android phone from the company, comes in at even cheaper, at 699 yuan. Its features include a 1.5 GHz quad-core processor from MediaTek, a 4.7-inch 720p screen and an 8-megapixel camera. 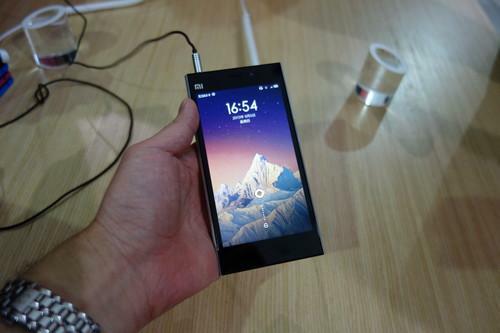 During the fourth quarter, consumers were clamoring to buy both Xiaomi phones, Peng said. "People are trying to get the phones for their parents, but it's been hard to get hold of, with the number of pre-orders becoming pretty crazy." Xiaomi has been a fast-rising company, partly by selling handsets packed with cutting-edge features at low prices. While its profit margins have been thin, Xiaomi is working to sell more software over its handsets to rake in added revenue. The Chinese company's phones are still largely only available in mainland China, but the vendor plans on releasing its handsets to Southeast Asia later this year.